Our TimeLine delay pedal provides you with twelve different delay machines, each with extensive control over sonic character and feel. Under the hood is a 30-second stereo looper, which can be routed pre- or post-delay—allowing you to record delay to your loop, or saturate your recorded loop in echoey goodness. When in TimeLine’s looper mode, you can access Record/Overdub, Play, and Stop for a fun and effortless looping experience. Want to take more control over your loops? MultiSwitch gives you remote control of TimeLine’s looper, allowing instant access to Record/Overdub, Play, and Stop. When you enter TimeLine’s looper mode, MultiSwitch unlocks three additional looping features: Reverse, Half Speed, and Undo/Redo. 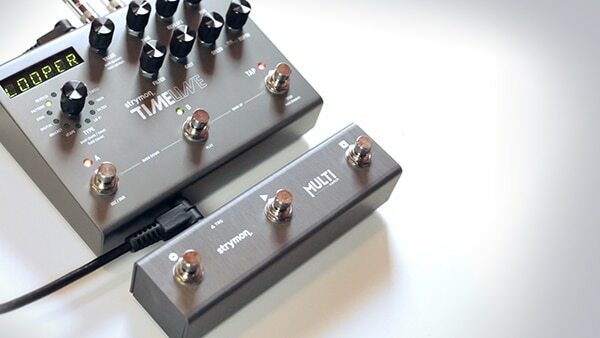 Gain full control over TimeLine’s looper in a simple, compact format—without the need for a separate power supply. Just plug it in with the included 1/4″ TRS cable and go. MultiSwitch gives you more control to use looping as part of your live performance, as a songwriting tool, to create live looping ambient soundscapes, or for improvisational jam sessions. I thought it would be fun to put together a video series demonstrating some of the sounds you can create when using TimeLine’s looper alongside MultiSwitch. Part 1 gives you the basic rundown on how to set up MultiSwitch, with several guitar looping examples highlighting the added looping functionality. Part 2 explores the Reverse function, as well as using TimeLine’s looper alongside a vintage keyboard. Part 3 takes you on a quick tour of using TimeLine to enhance your vocals (with a little beatboxing thrown in). Ethan Tufts is Strymon’s marketing guy and noisemaker. He spends most of his time using loopers and drenching everything in delay. He has owned 29 cars and is actively looking for his 30th. I see from this that the multiswitch makes it not possible to control any of the delay functions via an expression pedal. Is there a way to have both? Really nice demos btw and I am very impressed with the musicalness of the playing. With MultiSwitch we’ve really tried to push the limits of what the EXP jack was originally designed to do. Given that there only so many values that TimeLine can decode through that analog jack, it’s not possible to use both an expression pedal and MultiSwitch through the same jack. However, there are options! You could use MultiSwitch with the EXP jack and a MIDI expression pedal using the MIDI IN jack. Can this footswitch be used to change the regular presets? Or save presets in those switches? in multiswitch can I change the type of delay during a looping? I just got the timeline to replace my M9. I use the looper functions musically similar to Dave Knudson from Minus the Bear. In particular I am not able to figure out how to record the loop at half time so that when the 1/2 time button s hit again it plays at double the recorded speed. Any insight? @Jesse Mancillas – Thanks for supporting Strymon! 🙂 You would need to first place the TimeLine’s looper in 1/2 Speed mode before recording. This function is only available by either using the MultiSwitch pedal set to Looper Expression mode or by using a MIDI controller to send MIDI CC# 95 with any value. Completely sick of line6dl4 because of its continuous failures. In the same time since I discover Strymonn timeline it blew my mind, it´s awesome. In fact I thing it sounds quite better. Just an essential question. Does Timeline feature the same loop functions using the multiswitch? I want to confirm it can make the same marvelous possibilites looping using alf Speed, double speed, play once with double speed and all that stuff. I thought DL4 was the only one so I had to keep using and buying again it when it brokes. I think I have had more than four malfunctions using it. I´m thinking about to buy a Timeline, I´m sure it will be stronger so it will worth it to pay its price as long as it has the same loop funtions as I asked before. @Manolo Millán – Thanks for supporting Strymon! 🙂 With MultiSwitch, you have access to the Half Speed, Reverse, and Undo (to initial loop) features of the TimeLine’s looper. The behavior between the two pedals in looper mode is very similar when used in this manner.